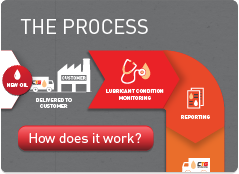 PROPEL Oil Management is a comprehensive approach to managing the lubricant lifecycle. Professionally Renewed Oil Prolongs Equipment Life. Significantly increase machinery reliability and reduce machine down time by maintaining the protective oil anti-oxidants which prevent oil degradation. Benefit the environment by eliminating waste oil. CTG renew industrial oils to as good as new specification or higher. Let CTG conduct a proactive oil condition monitoring, reporting and renewal program for you, a program that requires no costly time investment by your staff.